Spring had just sprung in Berlin when we last posted (March 31) and the period that followed was just about as glorious as can be. In Goldilock's words, "Not too hot, not too cold, just right." 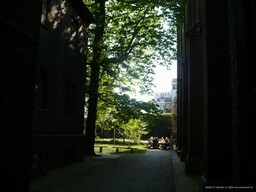 The trees blossomed, the lawns turned green, sidewalk cafes sprouted, and we were happy to be outdoors a lot. When we left off our saga, we had made the decision to bicycle in a grand triangle from Berlin to the southwest, then east to Poland, and then north and west to Berlin. Consequently we were serious, if not anxious, about improving our bicycle legs, lungs, and fannies. As to the last, we knew that if we were to bike day after day that could become — the sore point. 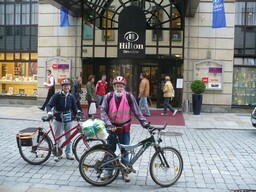 In April and May almost every time we strayed from home we went by bike. To the west we went to Spandau Castle (older than Berlin itself) and on another day to the Olympic Stadium, made famous as the home of the 1936 Olympics (and this August the site of the World Athletics Championship). We'd been to Spandau in the winter of 2005 and hadn't seen everything because it wasn't all open and because it was too cold to stay out too long. This time the spring weather really enhanced the experience, and we walked the fortress walls that were open and saw all the indoor exhibits. 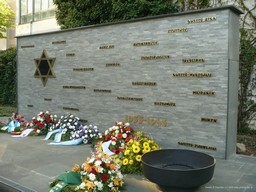 One special part was a collection of Jewish tombstones. On the way to the Olympic Stadium we stopped briefly in front of an early modern architecture building by Le Corbusier. That confirmed once again that we don't like his architecture at all! Gerry thinks the stadium itself has a certain grace and that it has been nicely modernized to provide amenities such as VIP boxes and radio/TV booths. 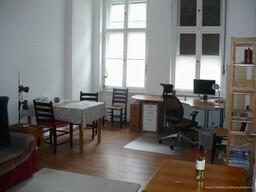 Jan disagrees about its appearance, but does think it is interesting historically. With our annual tickets we kept up our visits to the DHM (Deutsches Historical Museum) and the National Museums (SMB). At the DHM we saw a special exhibit commemorating the 500 birthday of John Calvin, an exhibit on the history of the German language, and an exhibit of the wonderful posters and book covers in Persian miniature format painted by Arthur Szyk, a Jewish-American artist born in Lodz. We also continued to work our way through this fact-filled history palace. The density of information was a bit too much for Gerry but Jan, reading German much easier, just about made her way through the last of the 2000 years of Germany history. At the SMB Gemälde Gallerie we much enjoyed the special exhibit comparing Rogier van der Weyden and the Master of Flemalle and we also gave ourselves another tour of parts of their permanent exhibitions. 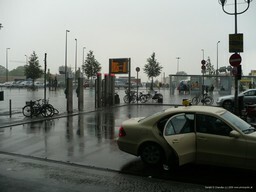 One of our regrets as we left Berlin was that we didn't make time to go there more often. Another visit to an art gallery was to the Berlin Guggenheim; on display were about 30 super-realistic paintings. They were so realistic that it was at times hard to believe they were not actual photographs. We wryly approved this variant on modern art. One day in the middle of April we set out to explore the greater Kreuzberg area, concentrating on a walking tour given by Lonely Planet (although we were on bikes). When we passed St. Ann's Church we peeked in at the garden in back. We were noticed by the people there and they wouldn't hear of us not joining their tea party. So we had an hour break where we got to meet some lovely people who get together once a week; we shared their tea and cakes. Gerry stumbled along in German, and Jan was delighted to listen to the Plat Deutsch accent two of the ladies from the far north east sported. She reckons it's the closest thing Germans have to a Yorkshire accent. We went on from there to several other churches; the St Thomas church had a very moving exhibit on how their pastor was badly treated by the Nazis. A few days later we were back in the same area to see the Labor Day (May 1) parade. There were actually several parades: we saw one which was pretty quiet and missed finding another because it was too quiet. The whole area — maybe the whole town — had a bon enfant (as the French say) atmosphere; that is to say there was plenty to eat, the day was bright, and everybody was having a relaxed good time. 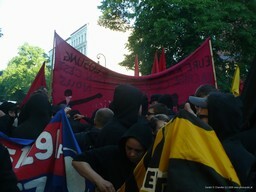 In the evening things changed: the "Hardleft" Parade started about 6p.m. 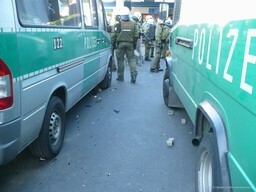 and it lived up to its name: a fair number of people came dressed in black hoods and were prepared to not only confront but provoke the police by throwing stones (and even Molotov cocktails). A reporter came up to us and asked innocently enough what we were going to do. Our bicycle helmets and bright orange safety vests had incorrectly given her the idea that we were intending to be part of the violence rather than simple tourists. She, and a few other people we talked to gave us the idea it would be a good idea to go home before things got too rough. In fact, by accident we walked right into and through one ninja-police confrontation, happily only seeing and not feeling the rocks. Before that day we had no idea of what was coming; we hadn't read articles like this one. The history of what the Nazi's did is unbelievably depressing. One simply wants to go back and change history. That is impossible. The bright side is that most of today's Germans have similar feelings. 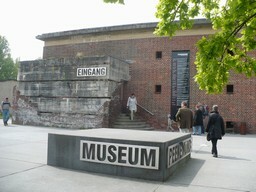 Besides the St Thomas Exhibit, which concentrated on one person, Berlin and its region abounds with other memorials. A few days later we went north to Sachsenhausen and joined the annual memorial service there for the thousands and thousands of concentration camp inmates who suffered. We'd also been there in 2005 when our short suffering in the bitter cold made us appreciate the tribulations of the inmates. This time it was spring and it was much more comfortable going about. (That morning we'd walked along the nearby lake front and felt in another world as we admired the scenery.) Still a few days later we attended the ceremonies at the Berlin Central Synagogue commemorating the Ermordeten Berliner Juden(The Murdered Jews of Berlin); in a non-stop 24 hours session the names of 55,696 disappeared were read. Unfortunately for East Berliners the Hitler regime was followed by the establishment of the DDR (East German) government and the 1961 construction of the Berlin Wall. During April and May we biked along considerable portions of the historical trail that now traces the route — the Mauerweg (for example, we biked along 14-13-12-12 one day); the wall itself is all but gone. It's still strange to imagine being on one side and not being able to get to another. One spot we visited is on a canal in the center of town: East German guards shot and killed a young man there who tried to swim across the canal to the West. We also went to several events in a series to discuss the Wall and its aftermath. 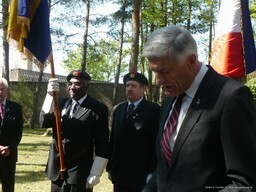 Speakers included those who worked openly and secretly against the DDR dictators. 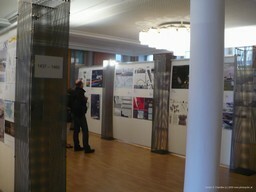 More surprising was to hear other speakers who supported the DDR and continued to do so. We got out for a few evenings of lighter entertainment, but it wasn't pops: We enjoyed Eugene Onegin at the Staatsoper and Tannhäuser at the Deutsches Oper. The night we showed up at the Schinkel-designed Staatsoper Jan noticed with alarm that there wasn't a crowd waiting to get into the door. We soon learned that we were among the few to not know that the opera had been canceled so the auditorium could be used for a special event. Fortunately it was quick and easy to get tickets for the rescheduled performance. Another outing related to the entertainment industry was a tour of the Deutsche Welle studios. This is the German equivalent of the BBC; they have an annual open house and, as it was pretty close to our apartment, it was very convenient to bike over. Imagine our surprise — and theirs — to find we were on a private tour. Nobody else showed up. They had to round up somebody to give us the tour. 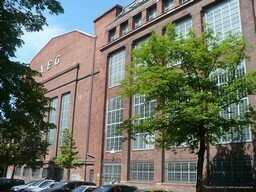 The DW studios occupy part of a former AEG factory (a related building), which is very important in the history of electrical technology; seeing the building was an added bonus. They have one of the earliest underground passenger railways in the world; it was used to connect two parts of the factory. Another bit of entertainment came when we read about the competition to design a Freiheits- und Einheitsdenkmal (Freedom and Unity Monument) to commemorate the 20 years of East-West Germany unity. 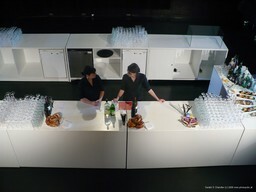 The Berlin Tagesspiegel, reporting on the display at the Kronprinzpalais of the 1000 or so entries, agreed with the jury that none of the competitors matched up to the quality desired. A few days later we went over to the Kronprizpalais (when asked, people right next door didn't know where it was) and found that we felt the same: not "just right," to again quote Goldilocks. Inspired by some of the entries that he liked best, Gerry went home and created his own entry. He mailed it off to the newspaper and — never heard another word. Maybe in five years something will be built and he'll recognize a few stolen ideas. That will be okay; Gerry didn't create his stuff ab-nihilo. Who said imitation is the sincerest form of flattery? 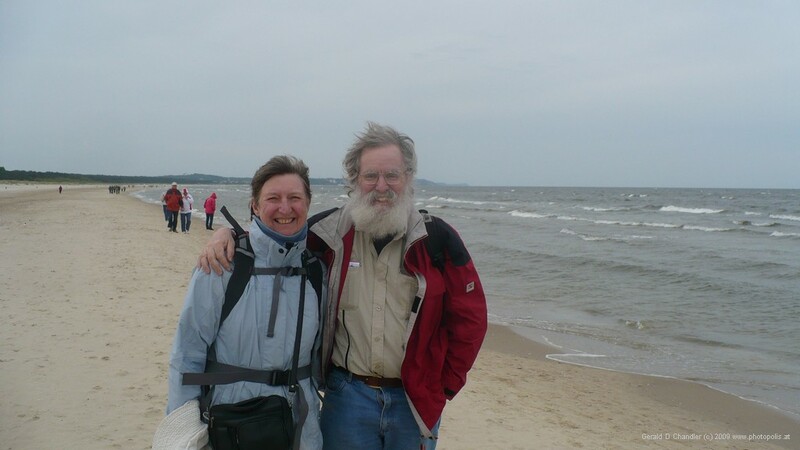 On two successive weekends we took the train north for day outings on the Baltic coast, or the Ostsee, as the Germans refer to it. We couldn't leave Berlin without seeing its northern hinterland; with time running out and at last almost-warm weather on the coast, we went. They were two very, very successful days. The first, May 17, took us to the Peenemünde-Swinemünde (S'winoujs'cie in Polish) stretch of coastline. Peenemünde was the site of V1 and V2 rocket research; there's a great museum there that documents the genius put to evil causes. Swinemünde was taken by Stalin at the end of WWII and added to Poland; it was interesting, but so down-market by comparison to Germany; at least we had a walk on the beach and saw the old fort. 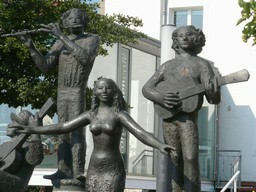 On May 23 we went to Rostock-Warnemünde and Stralund; Rostock, is the bigger town with interesting medieval remains. 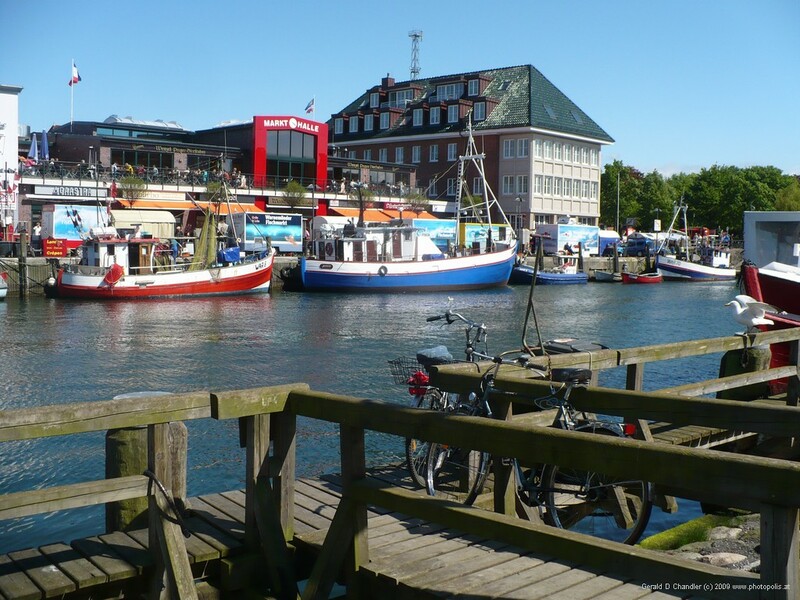 Warnemünde, is the holiday coastly resort as much up-market as Swinemünde is down-market. 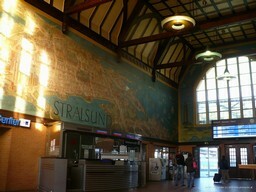 At the end of the day we took an hour train ride to Stralsund, another hanseatic, city with a rich heritage. That evening coming back on the train to Berlin our carriage was mostly filled with drunken football fans. A few of them didn't have tickets and gave the conductor a hard time. At the next stop four very burly policemen got on and at the next stop the ticketless drunks were put off. As the middle of May passed we forced ourselves to overcome our lethargy, face reality, and start preparing our departure. Through Craigslist we advertized the things we wanted to get rid of. Fortunately the biggest and most expensive item, our flat-screen TV went quickly. Everything else figuratively just sat collecting dust. We kept using them to almost the last day because they didn't sell. 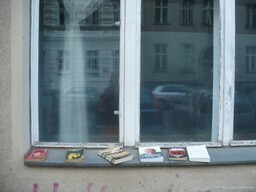 About twenty books went on the window ledge in front of our apartment and they were quickly snapped up by passers-by. We gave two boxes we'd made into a coffee table to the guy who took our TV. The real coffee table as well as the microwave got left behind for our landlords to do with as they liked. And still we owned twice what we are used to traveling with. Twice as much clothing, twice as many books, even twice as much electronics. Two days before our departure we took the bulk of the stuff that we'd be storing to the locker in south Reinickendorf (four kilometers away) that we'd reserved some weeks earlier. The last morning, May 31, was a hassle, with twice or even three times the things needing to be done as anticipated (by Gerry; Jan was much more pessimistic). After our last Berlin breakfast Gerry took our computers and a few other last minute items to the locker while Jan did last minute cleaning. At last out the apartment door we went and put our keys through the mail slot. It felt strange: we couldn't get back in again. And then we walked thorugh the short hall and the outside door for the last time, mounted our bicycles, and were off. After confirming that we would be coming to Paris and taking Veronica's flat again in July 2009, we had started to think about biking the 1000 km or so to Paris. That would have been a quite interesting trip; we abandoned that idea because we never found a good way of getting our mountain of luggage to Paris: Initially we considered shipping it by DHL but that didn't work out and we considered renting a car and carrying it all to Paris and then going back to bike but that didn't seem too good an idea, so in the end we opted for a storage locker in Berlin and a round-trip ride starting and ending in Berlin. Our original plan was to ride sort of south then east then north and back west to Berlin, but having studied the map and consulted Wikipedia, and learned a bit of the history of Luther and Wartburg Castle in Eisenach, Gerry knew we had to go there. So we settled on a triangular trip, southwest from Berlin to Eisenach, then east to Dresden and on to Görlitz, and finally north to Frankfurt an der Oder and back to Berlin. We chose Görlitz because it was reputed to be one of the best preserved old German cities and we had seen lots of ads for it around Christmas time. Dresden was a must, too, because during a day trip there in fall 2008, we missed the most famous of its museums, the Grüne Gewölbe, and Jan was especially determined to see it. The rest of our route was chosen so we would get to these three cities and get back to Berlin with a reasonable amount of time and effort. Because of this we ended up going through a dozen or more places that we'd never heard of (or had only the slightest idea about) and that were terrific; they really added to our appreciation of Germany, its history, and culture. During the first part of the trip we spent lots of time in Martin Luther country, first in Wittenberg where he created the Protestant Reformation with his 96 theses, later in Eisleben where he was born and died, of course Eisenach where he did the first German translation of the Bible, and still other places. We got tastes here and there of the history of the Bauhaus movement, including its major home in Dessau, and the important but lesser sites of Weimar and Löbau. 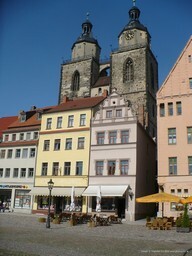 Among our discoveries were Sondershausen and Mühlhausen which both have well preserved/restored historical royal centers. So many German towns have a nearby castle, most of which in East Germany have been converted into museums of one kind or another. We biked west-east along the northern edge of the Erzgebirge ("Ore Mountains"), so that we could visit the towns that silver mining built and made rich: Zwickau, Chemnitz, and Freiberg. We knew in advance that it would be the hilliest part of our trip; fortunately by the week we spent there we were in pretty good shape. After mining, technology made Zwickau and Chemnitz even richer: Zwickau is where Audi cars got their start and we toured the August Horsch Museum, dedicated to the founder of Audi Automobiles. (Audi is the Latin form of his name, which means "Listen".) We also saw there how Trabants were built; even if a cheap car the process was fascinating. 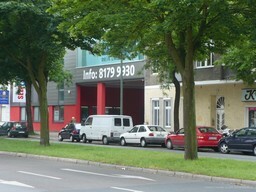 In Chemnitz, a mostly run-down city, we enjoyed the very modern Industrial Museum. In Turkey in 2002 we'd met a couple from Chemnitz who told us how pretty their city was; with some exceptions we didn't find it so. 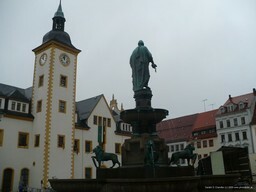 Freiberg has a lovely old square where we spent a few hours waiting for the rain to pass. 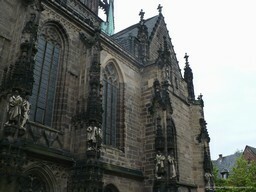 If there hadn't been so much rain we would have left the city after just a morning there and thus missed the wonderful cathedral and the world's largest mineral collections. From Chemnitz we made a day trip by train to Leipzig which is highly impressive; a bustling city rebuilding itself with two very nice churches and a wonderful main square, nicely restored from WWII damage. The city was the site of the largest anti-communist demonstrations in 1988-89 and these were the immediate precursors to the fall of the Wall and the DDR. We went to the site of these demonstrations and the church from which they were organized; we'd seen both on a documentary a few months earlier. 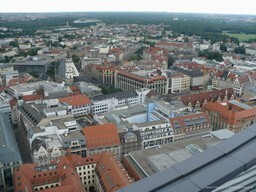 We also went to the top of the Leipzig tower and got a good appreciation of the locale. 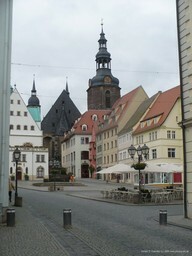 We wouldn't have gone at all if we hadn't been waiting for the repair of Jan's bike in Chemitz. As mentioned above, we returned to Dresden mostly because it was on our bike route; in fact, because of mountains we wanted to avoid, we just about had to go through it, but also to please Jan. It was a happy visit although we almost missed the Grüne Gewölbe because we hadn't realized that tickets were very limited; on our first attempt tickets were already sold out for the day. When we did get in Gerry agreed it was worth the effort. On the outskirts of town we visited the former royal estates at Schloss Pilniz, which now house the decorative arts that overflow from the central museum. It too, was a leftover from our first visit when lack of daylight prevented us from seeing it. All along the way we saw lots and lots of churches. 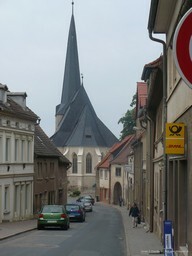 Wonderful big and wonderful small churches. Sonderhausen will filled with them. 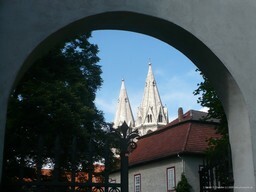 Perhaps the best came on almost our last day, when we visited a former monastery in a small village called Neuzelle; it has a baroque church to match that of St Gallen in Switzerland. As Michelin would say, it is worth the trip. Biking was sometimes a love-hate affair, kind of like climbing mountains. Long uphill slogs were, well, slogs. But we got better and better. And the downhills were lovely rewards for our climbs — except where our speed terrified us. When we left Berlin we had had experience with only the smallest of hills and really weren't in great shape. But by the end we'd really improved both lung and muscle power. On our return to Berlin to catch the Paris train we rode our bikes around town to do our business and it seemed like child's play. Most days we biked 4-6 hours in the morning and then quit for the day. We biked 21 out of our 35 days and "rested" the other fourteen nights, primarily as second nights in the more interesting cities. On those days we went to a museum or something similar, and had more than just an afternoon to get acquainted with the town. We never had a flat tire. Our one mechanical problem was a broken spoke; the snapping sound was heard almost in front of a bike shop (in Chemnitz) and we got it fixed over a weekend (while we went to Leipzig). Three times we simply gave up on the bike and took the train for short stretches. On the first it wasn't our bums or legs that gave out, but Gerry's shoulder: suddenly one night he could hardly do anything with his right arm. It was too painful to dress, to brush his teeth, or anything. (There wasn't any explanation; later doctors guessed an inflamed tendon but there hasn't been any confirmation of that.) 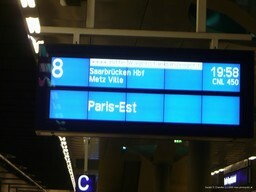 So the next day we took a train and skipped the 50 km we wanted to ride. Jan saw a silver lining in this in that we also skipped going over what would have been our first mountain. The second train was from Freiburg to Dresden; we'd had a series of bad rainy days but had ridden through them; this time, wanting to get to Dresden early (and not sit out the weather somewhere) we took a morning train. That worked out okay but it would also have worked out okay if we'd waited for the weather to lift as it did; then we would have had a nice 20 km ride through a forest. Our third and last ride was July 4, back to Berlin from Frankfurt-on-Oder; it wasn't a wimp-out: A little delay here and a little extra sight-seeing there meant that we didn't have time to get back to Berlin under our own power as that would have required us to do an impossible 90 km west on to Berlin. That was partially a blessing in disguise; for only an extra 5 euros we also bought an unlimited day-travel ticket and went past Berlin to see Brandenburg, which we had previously not visited. 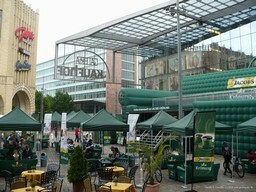 That last day we got up in the morning in Frankfurt and a few hours later got off the train at Alexander Platz. We were proud of ourselves, feeling like conquerors of the world. 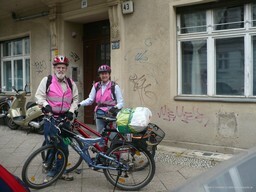 We carried our bikes down the stairs, quickly arranged things, and set off to bike to our storage locker in Reinickendorf. Paris was now what was on our minds. 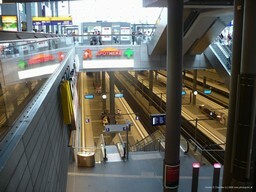 We got to the Berlin Hauptbahnhof hours early, figured out from a sign where our car would be on the platform, and waited there, very relaxed. When the train came in there was sudden panic: the train was backwards from what it should be and we had to race to the other end in the two, the tiny two, the impossibly tiny two minutes the train would be in the station. Two strangers spontaneously grabbed some of our baggage while Jan took one of the bikes and Gerry grabbed the second one and the leftover luggage. And we got on. And we had a good night's ride to Paris. After so much biking it was strange to leave the effort to the Iron Horse.